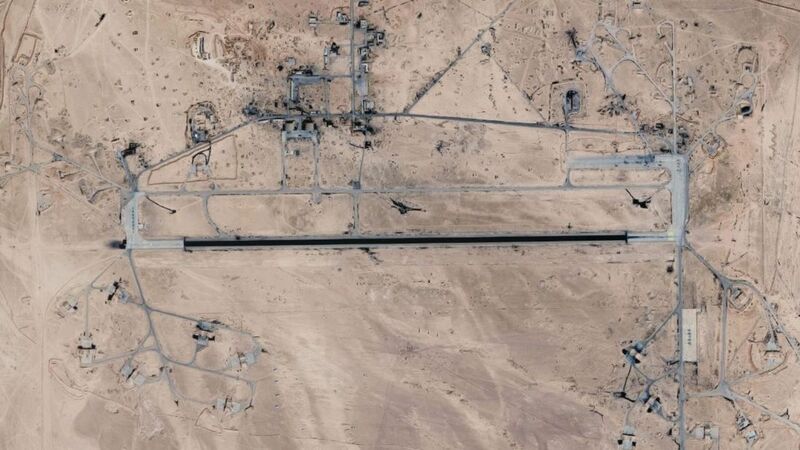 A Google satellite image showing the T4 airfield in Homs, Syria. 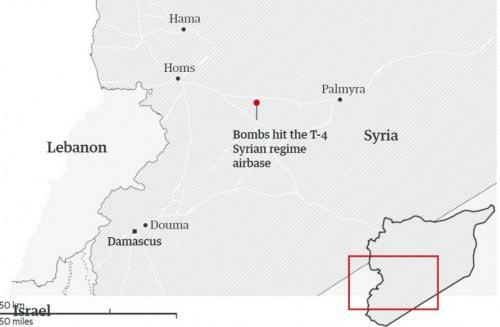 Instead, Russia and Syria have accused Israel of carrying out the strike on Syria’s T-4 airfield, situated about halfway between Homs (Syria’s third-largest city) and Palmyra (famously the site of ancient ruins). RT reports that two Israeli F-15 jets fired eight guided missiles at the airfield from Lebanese airspace. The jets never entered Syria. Of these, Syrian air defenses intercepted five. The attack left roughly 14 people dead, including Iranians and Syrians, the Associated Press reported. Monday’s missile attack came hours after President Donald Trump warned there would be a “big price to pay” after a suspected poison gas attack Saturday on the last remaining foothold for Syrian rebels in the eastern suburbs of Damascus. At least 40 people were killed in that assault, including families found in their homes and shelters, opposition activists and local rescuers said. 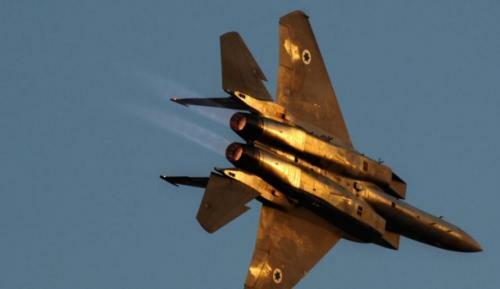 Eight missiles were launched by two Israeli Air Force F-15 jets at the T-4 airfield located about halfway between Homs and the ancient city of Palmyra. Israel previously launched a strike against the base back in February after an Iranian drone ventured into Israeli airspace, provoking an alarmed response. This isn’t Israel’s first unprovoked attack on a Syrian military installation: most recently, Israel launched an attack against a government installation near Damascus almost exactly two months ago. Before that, the Israelis launched another unprovoked attack back in September. Lebanon’s Al-Mayadeen reported Monday that Israeli reconnaissance aircraft had been spotted close to the border with Syria during the attack. The missiles crossed Lebanese airspace over Keserwan and Bekaa before heading toward Syria. …denied involvement. According to the Guardian, Russian troops have been known to frequent the base, but it appears no Russians were caught up in the early Monday attack. French President Emmanuel Macron has said that chemical weapons use in Syria would cross a “red line” that would provoke France to intervene. Tellingly, the Israeli embassy in Moscow refused to comment on the attacks, interpreted by many as an admission it was behind the strikes (and by exclusion: the US vocally denied it was behind the strikes). Israel has said it is “concerned” about the Iranian military presence building on its border. Specifically, Israel is worried about Iranian efforts to repair advanced guided systems. Israel, along with its latest regional ally of convenience, Saudi Arabia, has been steadily inching toward an all-out war with Iran by way of Syria. Meanwhile, it once again appears that unconfirmed allegations about a chemical attack organized and backed by Assad were cobbled together by a foreign enemy to “justify possible military strikes from outside Syria,” as Russian Major General Yury Yevtushenko predicted in a statement yesterday. Video of the missiles screaming toward the airbase was captured and shared with the AP. The IDF sent a tweet hinting at an attack against T-4 as early as Feb. 10, around the time an Israeli F-16 was shot down over the Golan Heights border area. While the US was quick to pin the chemical attack in Ghouta – the last rebel stronghold in what’s considered suburban Damascus – on Russia and Assad, the US jumped to a similar conclusion a year ago when Trump authorized a fusillade of tomahawk missiles to strike a Syrian airbase. It was later learned that the US had no proof to suggest that attack was orchestrated by Assad’s government. As for Israel’s desire to provoke another regional war, it is understandable in light of growing Iranian influence on its border, while President Trump recently announced his intention to pull US troops out of Syria – although the neocons that now dominate the Trump national security team have been aghast at such a suggestion, and have managed to convince the president to slow-roll this. It remains unclear if they staged the false flag chemical attack in Syria with the help of Israel, or on their own. Meanwhile, the Guardian says the IDF views the chaos in the West Wing as the latest sign that it must take matters into its own hands, and not wait for explicit US approval. However, with a UN Security Council meeting scheduled for Monday over recent events in Syria, we now wait to see what kind of response Russia and Assad will decide on, and how Moscow will respond to this provocation by Netanyahu, who has been friendly – at least superficially – with Putin in recent months.